That title sounds like the name of a Big Bang Theory episode, but unlike Sheldon in the t.v. show, neither Matthew nor I have a favorite spot on our couch, because it has become decidedly uncomfortable. To review, this is the estate sale couch that we bought in late 2010 and had re-stuffed in the fall of 2011. What seemed like a good purchase now seems much more questionable — we have gotten five years of use our of it, but I’m afraid it’s time has come. Too narrow: While we loved the length of the couch from the beginning, it quickly became clear that this couch was not the best for lounging around or cuddling. Not ergonomic: For over a year now, we’ve noticed that we get head, neck, and/or backaches when sitting on it for any extended period of time (by which I mean more than five minutes). It used to be comfortable for sleeping, but I’ve noticed that that is no longer the case. The upholstery: The light color, while great for brightening a room, is quite the dirt magnet. It looks pretty grungy in general. We now keep a sheet over the cushions to hide the oily stains from the hydrocortisone ointment we put on the back of G’s knees for eczema. If not for the other issues, I would consider having it cleaned and/or getting a slipcover, but at this point, it’s not worth it. All-in-all, it’s time for this couch to go. The question is, what next??? 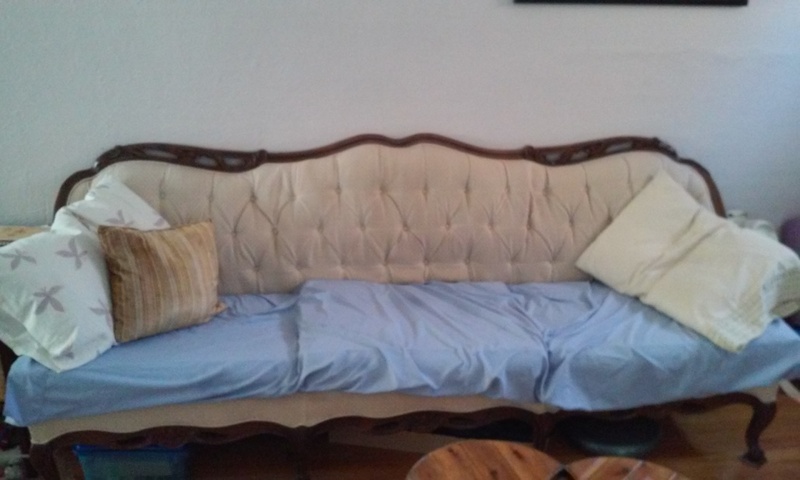 Used couches: In the end, this couch was a bit of a lemon. I’m not sure how we’d avoid that again if buying used. Plus, a couch feels more personal than, say, a chest of drawers — I’d be pretty particular in the used realm. Our current couch came from the formal sitting room of the previous owner and was all but wrapped in plastic — “like new” despite being 40+ years old — not sure what the odds are of finding something similar again. Also, bed bugs. New couches: Our standards would be pretty high, at least for our ideal — ergonomically sound (which may be an oxymoron for a couch), and built to last, with sustainability in mind. At this point, we’re talking a LOT of money. Moving: Then, there’s the fact that at some point, we’ll be moving. Hopefully only one more time, but maybe more. Couches are a beast to move, and you risk damage with every move. Not a huge deal for a <$200 Craigslist couch, but a big problem for more of an investment. And that’s if the couch even fits in the new space. With all of that in mind, we’ve been considering some other options. Any of these set-ups, done nicely, would be a noticeable investment, but much, much more affordable than the fabled ergo-eco-couch. The first two options are floor-based, which would be a little tricky due to the large baseboard air-return along the wall where we currently have our couch. We’re also not certain we’d like the floor-based option for sitting. We would ideally try out a tatami mat before going this route, and I’m not sure that’s possible, locally. The bed or daybed options would be plenty comfortable for prone positions, but again, maybe not so much for sitting. The recliner is probably the best sitting option, but not so great for cuddling. Is there something that is decent for reading and watching t.v. in both sitting and prone positions? Maybe combining two or more of the above ideas? Whatever we get, I want both a color that hides dirt and has some kind of removable cover for easy, regular cleaning. Have any of you experimented with couch alternatives? What is/was the set-up, and how did it work for you? This entry was posted in Green Ideas, My Life and tagged apartment living. Bookmark the permalink. Not sure if it helps much but I bought a new couch (and matching chair) at a local furniture store (Great American Homestore in the Memphis/north MS area) back when I first bought my house in 2005, and we’re still using both. I believe all or most of their products are Made in USA, which is good. It’s a microfiber material in a similar color as your couch above, and while it does show some dirt, it can be cleaned up pretty easily. I want to say the couch by itself was around $600 or so, which isn’t terribly expensive, especially if you can use it 10+ years. Just don’t get a sleeper sofa if you’re worried about moving it, because those are a major pain and much heavier than non-sleepers. I still have my parent’s old sleeper sofa we had in the 80’s (with slipcover!) in my movie theater room. I hope I never have to move the thing. But it sure has held up! Good to know about options in the couch realm. I admit to being attracted to the no-couch/non-traditional seating option, though. We gave it a test drive over the winter with some lawn-furniture cushions and weren’t crazy about it, but I don’t think it was really a fair trial. If you decide to replace with another couch, you and Matthew are welcome to come hang out on ours before you make your decision. We have had this couch for probably five years now. We adore it! So-o-o-o comfortable. I can’t remember the manufacturer, but we bought it at Carol House, whose owners refuse to carry any products made with dead animals.